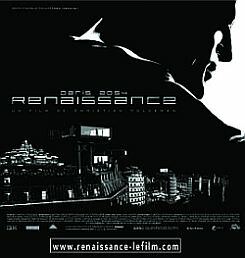 Set in Paris in 2054, the animated science fiction film, Renaissance, is visually stunning. In the film, Ilona, a genetic researcher for the sinister corporation Avalon, disappears. Police Captain Karas (Daniel Craig) is charged with the task of finding Ilona. Avalon considers her an asset that they need at any cost. Karas and Ilona’s sister, Bislane, soon discover, though, that they aren’t the only ones looking the missing girl. What she knows is immeasurably important for Avalon and for the future of the human race. The plot of Renaissance is pure film-noir, and not particularly compelling: Karas is the uncompromising cop, Bislane the troubled sister, Ilona the seemingly innocent victim. The prescribed mysterious researchers, corporate villains and henchmen all appear. A formulaic film that fails to delve into the relationships between most of the characters. Nor does it explore in depth the more interesting allegorical elements of the narrative, such as the comparison of Avalon to modern pharmaceutical corporations, and society’s obsession with beauty and ageing. While the narrative elements of Renaissance are average, the film shines brightly in one area. 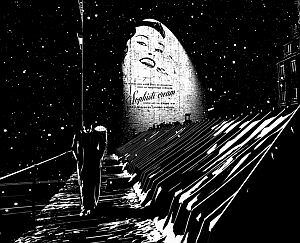 The black and white animated visuals are incredibly good. From an early scene where Karas rescues a child in a shootout, to the future visions of Paris’s most famous landmarks such as Notre Dame, the Eiffel Tower and Sacré Coeur, the design of the landscapes and the movement of the characters captivate the viewer. The visuals alone make this a remarkable and sometimes eerily beautiful film. The animation in Renaissance uses the motion capture technique. In it actors wear specially designed suits that track the movement of their bodies. The actors are then digitalised and placed in the animated world of the film. The technique gives a highly realistic appearance to the movement of the characters. As a result the ‘performances’ of the characters in Renaissance are extremely fluid and natural. The animators have also strongly emphasised lighting and shadow. With a turn of the head or the dancing of light across a face, the visual landscape on screen changes, sometimes drastically. The shading and contrast are so developed that it is easy to become mesmerised by Renaissance’s visual aspects, and totally to forget the plot of the film. Renaissance's average narrative keeps it from being a brilliant film. Yet it is difficult to exaggerate the brilliance of Renaissance's animation. It is a film that is compulsory viewing for fans of animation, science fiction or visual art. Meanwhile, most other people can just sit back and will enjoy the quality of the spectacular visuals. God's Politics is a book which, though flawed, does manage to straddle the divide between left and right, and in so doing, poses some interesting questions that neither side of politics can comfortably answer. Train lovers are usually first lured by steam engines and stations. Enthusiasts at the Model Railway Association pursue their passion in miniature. They are also found in busy railyards around Australia.